MINNEAPOLIS, Minn. – Having dreamed this moment a million times as a kid growing up in South St. Paul, Minnesota Twins starter Jack Morris finished his bullpen warm-up with a curious arm motion just prior to the start of Game Seven Sunday night. His name ringing loud and long throughout the Metrodome just before the start of the final, fateful game of the 88th World Series, Morris picked up a towel and waved it vigorously over his head. Some four-hours, 125 pitches and a 10-inning, complete-game 1-0 shutout of the Atlanta Braves later, Morris held another towel in his hand. Leading a memorable team victory lap around a frenzied Metrodome after Game Seven, he once again whipped the towel in a helicopter fashion with the same powerful right arm that had propelled the Twins to their second World Championship in five years. Perhaps the only thing more amazing than Morris having enough arm strength left to salute 55,118 Homer Hankiemaniacs waving at his astonishing performance was the fact that this Fall Classic’s Most Valuable Player never considered throwing in the towel. Despite Game Seven pressure, hometown pride and, most of all, baserunners – Morris simply grabbed the ball instead of the bench and an early shower. Morris pitched strikes, grit and with the kind of heart that placed his work Sunday alongside past Series legends. In fact, as he circled the Dome floor, many of the Twins’ fans almost needed to take those Homer Hankies to their eyes in honor of the final act in this exhausting fall drama. And if there is truly such a presence as Metrodome magic, where the Twins remain unbeaten over the span of two World Series, then Morris is the master of all the building’s tricks. Carrying a 21-5 lifetime mark on the Dome mound, Morris called upon all his powers – which seemed supernatural at times Sunday – to baffle the Braves at their own game, which is the art of owing the close, low-scoring contest. With a live fastball, sensational split-finger pitch and a well-timed change-up, Morris stayed fairly free of trouble until the 8th inning. Suddenly, Morris looked around and the Braves had Lonnie Smith at third and Terry Pendleton at second with Twins manager Tom Kelly coming out of the dugout. “All T.K. said was ‘Do your best,’” said Morris of the meeting with Kelly. His best saw Braves’ first baseman Sid Bream ground into a first-to-home-to-first double play that ended the inning. “After that, I told him: ‘It’s ours now Jack,’” offered Hrbek, a fellow Twin Cities native who enjoyed some heroics of his own with a grand slam in the Twins’ 1987 title year. 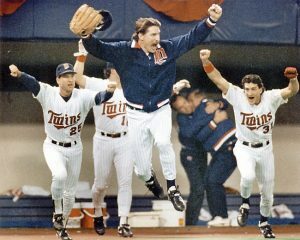 The 1991 championship did indeed belong to all of Minnesota when Gene Larkin drove home Dan Gladden with the game’s lone run in the 10th. The main case in Larkin’s point is Morris – the winningest pitcher of the 1980s who logged 281 innings this season and who has never given up the ball easily. Last night, Morris’ heart pounded with the pride of knowing he had the “TC” emblem signifying the Twin Cities of Minnesota on his sleeve. With his two young sons on hand, the 36-year-old turned back the clock into the time where World Series legends live and to a time where a kid’s imagination rules the day in the Seventh Game of the World Series. Somewhere down deep Sunday night, Jack Morris, now World Series MVP, was still the kid from St. Paul who once envisioned taking the mound for the Twins in Game Seven and taking a victory lap for all of Minnesota.